The ISDN technology switch-off is inevitable. And currently there is a need to find an appropriate alternative. All-IP is a rather perspective substitute. VoIP is a stable and cost-effective alternative in telephone industry. Though mobile communication should also be considered. Especially when IoT devices can be used and connected with the data transmission where reliability and safety play the most important role. There are two variants of ISDN: Basic Rate Interface (BRI) and Primary Rate Interface (PRI). When using an automatic telephone station, initiation of both variants is possible. BRI provides only two bearer channels, while PRI provides 30 bearer channels. A bearer channel in ISDN is a channel for data transmission. Either voice or data (fax, internet, etc.) can be transmitted through it. Advantages of digitalization were first of all higher data rates and the number of additional channels, alongside the improved quality of sound. Several phone numbers were also assigned to the telephone. Moreover, there is an opportunity to use IoT devices in the emergency power mode. In this case the current is provided by the telephone station. Even in the event of a power failure, IoT device communication, especially an emergency call, is possible. 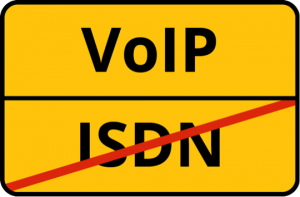 Many European providers have announced that ISDN will have been switched off by the end of 2018. Due to high costs, they declared termination of the contracts as early as 2015. Just a few providers including Vodafone (until 2022), reported they still want to support ISDN during the transition period. Alongside private clients, more and more corporate clients are currently being involved. The telephone industry is currently making the transition from ISDN to voice over IP (VoIP). The voice being transmitted in digitalized form through ISDN can be transferred the same way over the intranet or internet. In this case, the same connection is usually used as it was used for the internet before. Depending on the size of an enterprise, the costs may exceed the amount of a thousand Euro if the IP equipment requires changeover to the applied software. Furthermore, there is another problem: the systems operating through VoIP are often not reliable enough. With the development of IP technologies, noise susceptibility also increases. Failures during a phone connection are seldom, but they often take place at the internet connection due to the higher degree of complexity; SIP connects additional stratum to the already complicated structure. Additional servers, which may break down, require it. This may have a negative effect on stability of the operation and obviously decreases it. Due to the losses of several providers in 2016, it became clear that it may make sense to use multi-network SIM cards for IoT, at which the strongest network — regardless of provider — can be used, especially at performing critical tasks. 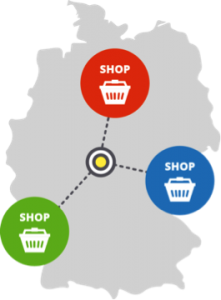 Imagine you work in a retail network having 35 branches all over Germany. Up to this moment you used ISDN for transmission of the payment data. This channel gives the best fit to your sensitive data because ISDN being a Point-to-Point Protocol ensures better protection from wiretapping and fraud than transmission of signals through internet. And now you switch the communication to all IP. As a rule, there is no problem with for at data transmission, though if there is any internet failure, your clients will be unable to pay with their cards. Beyond that, from now on you would like to ensure higher reliability at data transmission. In both cases the mobile network is a good solution. It may serve as an alternative for data transmission while there is no opportunity to use the internet. When choosing a provider you should also consider that you have 35 locations. In order not to check what network is available at each location and not to conclude contracts with different providers, you should choose a provider who offers multi-network SIM cards which may use any available network. If you want to get the highest level of reliability with this new solution, you should choose the provider of your SIM cards according to the corresponding features. Some providers transmit data not through public service networks, but develop a private network, the access to which is possible only over VPN-tunnel. This makes the transmission of the data more reliable. ISDN is a technology that currently outlives its usefulness. Therewith the phone providers are going to switch their clients over to all-IP technology. Sooner or later enterprises will have to consider an alternative to their ISDN connection. In many cases the transmission of data through IP can be a good solution, although many systems (alarm system, emergency calls, etc.) require other data transmission channels. If there is a need of ensuring a reliable, permanent connection to a system, mobile networks can provide the best option. Think over which (probably additional) components, hardware and necessary experience the considered options would require. Choose a suitable provider for your IoT project. (If you have to choose among the mobile communication solutions, you may find the recommendations on the choice of a provider in our blog). Test the new system and then switch to the new IoT solution. Make sure that in case of a fault scenario you can return to your previous one. Check whether you should or can implement additional configurations for IoT, which were impossible before. Terminate your previous ISDN contract.